Emily cleared her throat. "Leonard, while you were in the privy, so to speak, the lavatory, as it were, the water closet or crapper, if you will, anyway, while you were gone, Ed and I looked over your second, third and fourth stanzas, and we believe they are rich in imagery and tropes that vulgar readers will miss and the learned will mock. Here are stanzas 3 and 4 in case you need a memory refresher." Leonard busied himself with a cigarette. Ed chimed in: "I agree with Emily. I see these stanzas either targeting the 'middle-mind' or padding the narrative. The golden ax, the lady's mirror, the unrecycled wine bottle -- do you need all of that?" "You put this to music, right?" said the 19th-century reclusive genius. "Maybe if you sang it to us, we'd hold a different view." 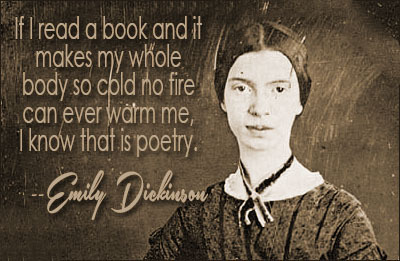 "I now feel physically," Emily said, quoting herself, "as if the top of my head were taken off, so I know it is poetry." "As my friend Randy Greenwald described the song, it's haunting," Ed said. "There is nothing extraneous about those stanzas, after all. They're drawn out just enough to evoke a leisurely hike up a mountain, as if someone's humming it, sort of to himself, almost unconsciously. But of course, that's Isaac humming it, in retrospect, knowing -- "
"His voice is cold. Why? He's had a vision. It's neither dream nor fantasy. Why? Because he is strong and holy. And then that cold and terrible word -- deadly, some would say -- 'must'." "No free will here, according to Abraham. There's no decision to make, thus no hesitation. It's like what I hear from bible-thumpers when they're in here getting liquored up real good: 'God said it, I believe it, that settles it.' No existential angst in this version, Mr. Kierkegaard!" That's how Ed felt about it. "My dad had no choice," Isaac must have thought.